When large bodies of water are involved, you're on your own schedule. Land's End Nautical Stripe Trapper Sweater ($60). Land's End Guildsman Workshirt ($49). Land's End Jeano 608 Slim Pants ($58). Land's End Heritage Boat Shoe ($89). Land's End Landmark Newton Card Holder ($29). Billykirk Large Tote Bag ($295). MyTinyTree Tobacco Pipe ($15). ASOS Leather Anchor Buckle Belt ($28). V28 Customs Watch Strap ($40). Ray-Ban Aviator Classic ($150). Otter-Messer Anchor Knife ($48). This edition of Garb is presented by our friends at Land's End. If you're not prepared, Spring can leave you soaked. Gant Indigo Madras Button Down ($135). 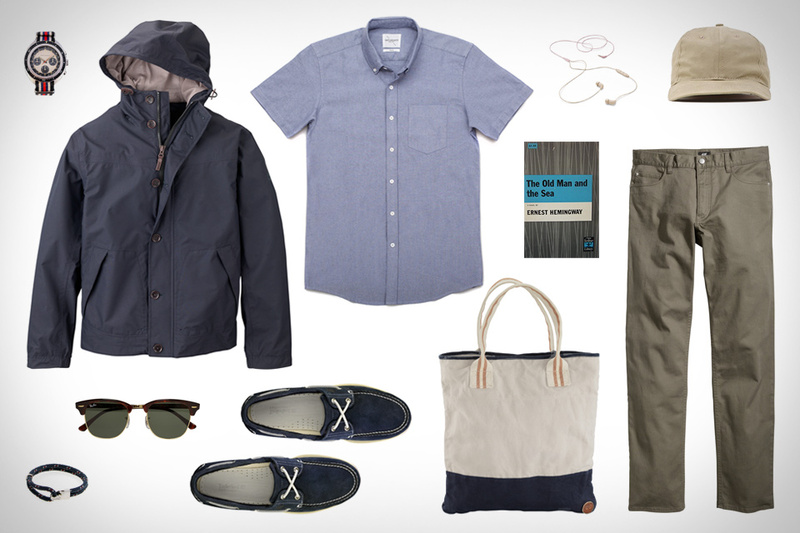 Gant Novh's Parka ($275). Gant Pocket Tee ($48). Gant Rugger Sneaker ($175). Gant Selvedge Madras Pocket Square ($40). Gant Stick Boy Raw Denim ($178). Gant Burton Sunglasses ($125). Gant Shantung Oxford Dot Belt ($125). Francesco Maglia Umbrella ($325). Baron Fig Confidant Notebook ($16). 1977 Rolex SS Airking Watch ($3,050).